before Korean American Tessa Ludwick became a child actress, she worked as a model, starting when she was only two and a half years old? before starting her modeling career and appearing on America's Next Top Model, Celia Ammerman lived across from a chicken slaughterhouse in Brooklyn? Shruti Haasan, the daughter of Indian actors Kamal Haasan and Sarika, is a singer turned model who is now also venturing into acting? model Albert Reed, selected to appear in September 2007 on the United States television show Dancing with the Stars, admits that he cannot dance? Keith Munyan, Jr., the Los Angeles photographer who has done publicity shots for Hilary Duff, Cindy Crawford, Jessica Simpson, and other celebrities is himself a former model? Larissa Riquelme, who gained international fame as a spectator at the 2010 FIFA World Cup, is Paraguay's highest-paid model? British model Daisy Lowe began her modelling career at the age of two? A model is a person who has the job of posing, or displaying works of art or fashion (clothes), usually for promotion of the product. They are often used for advertising in television and printed media, for example newspapers and magazines. There are many different types of models. Some models only use certain parts of their bodies. For example, a hand model is a person who only uses their hands. A hand model would be used to display certain items, for example rings and watches. These types of model are usually only used for advertisements. Fashion models are used to sell clothing or cosmetics. 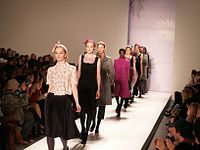 People who make clothing will often use fashion models to wear the clothing they make at fashion shows. The models will walk up and down a raised section of floor called the catwalk or runway to show the clothing to other people. Fine art models are hired by photographers, painters and other artists to pose for their art. Do thin models warp girls' body image? - USATODAY.com - Do thin models warp girls' body image? Fashion Modeling - Indian Model : India Models : Indian Models :Actors : Management Directory Pvt.Ltd. Francesca Dani - Models - Fashion, Glamour, and Runway Models Wanted! Too skinny models banned from catwalks - ws2m: TOO SKINNY MODELS?